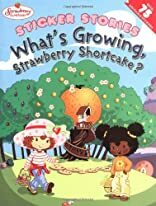 Home > Books > What's Growing, Strawberry Shortcake? There's so much growing in Strawberry World! Come along with Strawberry Shortcake and Orange Blossom and take a look. There are flowers, plants, fruits and more-it's all so berry pretty! Use the reusable stickers to decorate the colorful, nature-filled spreads.